There is a sentiment that I come across, not often in my circles, but often enough, that this is "it" for our kids. That a diagnosis of autism is the end all, be all, of their lives and we must be mournful they are not living "normal" lives. Or, that where they are right this second as children will dictate where they will be ten years from now as teenagers or adults. And so, we must mourn what they, as children, and we, as their parents, do not have. I don't mourn the life that I always imagined for my son Morgan. It was never his to have, nor was it mine as his mother to give to him. I mourn the societal expectations put onto our children, the labels and those expectations that come from labeling, and the thought process that stems from a doctor telling you, "Your child has autism." Autism isn't a death sentence, my friends. I'm very testy about the misconceptions surrounding autism- whether it's being autistic, parenting an autistic, or the myths surrounding autism. I mourn that, as parents, people look askance at us if we dare laugh at our kids' antics and forget that, at the end of the day, they're only kids and we're only parents. In the same vein, it isn't wrong to celebrate what your child has accomplished through hard work. Even if it's something small in appearance such as sitting an extra thirty seconds in a chair. I am not going to sit up on my soapbox and pretend there is zero anxiety in me for my son and his future. There is always something lingering in the back of my mind that I feel I must teach him before time runs out. But what stopwatch am I racing? He's not even nine yet. Where he is now will not be the place he'll be standing when he's 18, 25, or 30. There is time to allow him to be a kid, even if my definition of him being a kid might be different than others. I will also never say that he doesn't struggle due to his being autistic or that some days look like pure hell on him. The world is overwhelming for him a lot of the time. Most milestones for us have been painstakingly slow at times, but those that he has reached have been sweet. He struggles in school, but that is why we have a great team helping him to learn. I am not saying that a parent cannot be sad over their child being diagnosed as autistic- that is their right. I am saying that this is not "it." Development is not always static. Let your child and not doctors dictate what he or she is capable of doing. Don't ever sell your child short. Please, I'm begging you. Our children are capable of so much and have unneeded limitations placed on them by doctors, teachers, and other "experts." I struggle daily as to whether I should take a step back and allow Morgan to keep trying something or help him (read: do it for him). He keeps surprising me with what he knows, so I keep taking a step back. Don't ever believe everything you read in those books and manuals about what to expect when raising an autistic child. Don't let those (sometimes) wastes of paper steal your hope for your child. For those of you new to the world of autism, hang in there. 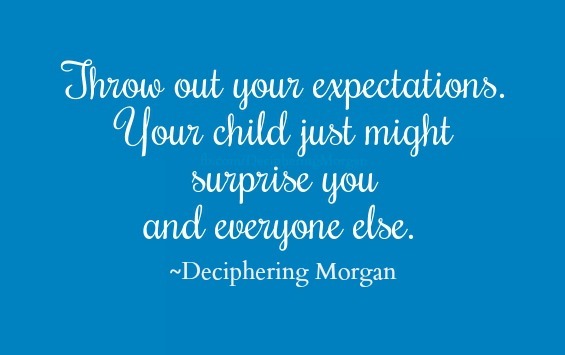 Throw out your expectations of what your child won't be able to do. 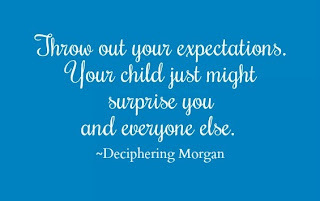 Your child might surprise you. Thank you for your words. I think peope get too caught up in expectations and forget to let you try. You're welcome and I agree. Wonderful words i wish could make everyone read and understand. Thank you for sharing and i look forward to anything else you might share.